Enveloped. Usually rounded but can be filamentous. The virions are 90-130 nm in diameter. segmented ssRNA(-) linear genome, encapsidated by nucleoprotein (NP) Contains 8 segments coding for at least 8 proteins. Segments size range from 0.8 to 2.2 kb. Genome total size is about 13.5 Kb. Viral RNA polymerase (PB1, PB2 and PA) transcribes one mRNA from each genome segment. Transcription is primed by cap snatching. mRNA are polyadenylated by the viral polymerase stuttering on a poly U track. Segment 7 mRNA can be alternatively spliced, giving rise to mRNA coding for P6 and P7 proteins. Virus attaches to sialic acid receptor though HA protein and is endocytosed by clathrins in the host cell. endosome acidification induces fusion of virus membrane with the vesicle membrane; encapsidated RNA segments migrate to the nucleus. Transcription of genomic segments by the viral polymerase produces mRNAs that are capped and polyadenylated by the viral polymerase. High level of M1 protein induces genomes segments export from nucleus by NEP protein. 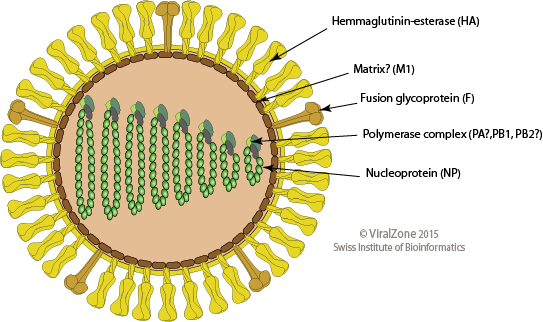 Virus assembly and budding occurs at the plasma membrane. ETYMOLOGY Infectious Salmon Anaemia virus.